I enjoy Peter Tomasi's work, and Outsiders: The Deep continues a line of quality work that includes Nightwing and Green Lantern Corps. But despite an interesting premise and some welcome continuity notes, the story never quite distinguishes itself beyond standard superheroics, and it makes me hesitant to continue following this title. Alfred, Batman's faithful butler, leads the Outsiders -- I can certainly see how many might dismiss this as preposterous, but I rather enjoyed it. To me, it seems even more ridiculous that Alfred could be Batman's partner all those years and not be capable of heroics of his own; indeed it's past time someone acknowledged, as Tomasi does, that Alfred is in essence Batman's father. Tomasi achieves a tone somewhere between Mission Impossible and Charlie's Angels as Alfred directs the Outsiders remotely, and the cloak and dagger beginning was about the best part of this story. Tomasi attempts to take a page here from Geoff Johns' playbook, positing a connection between everything else you've ever read about the Outsiders -- that Batman hand-chose all the teams because of how they represent his own abilities on a grand scale, and that the major villains they fought over the years have all been foot soldiers for a shadowy organization called, of all things, the Insiders. This might have been interesting if it worked, but Tomasi fails to offer any real proof for the last point, and indeed the Insiders present as such run-of-the-mill villains -- they'll live forever even if it causes the death of innocents -- that perhaps it would be better if they weren't so tied to Outsiders lore. The true strength of this story is in the long history between the characters -- that's the real "deep" here. Geo-Force, Katana, and Black Lighting, especially, have never been A-list superheroes, but they've stuck by one another a long time. When Geo-Force and Lightning fight (or Geo-Force and Katana kiss), Tomasi brings out the nuances of their feelings for one another, with clear, expressive expressions from artist Lee Garbett. Similarly, I appreciated Tomasi making full use of continuity in this book. 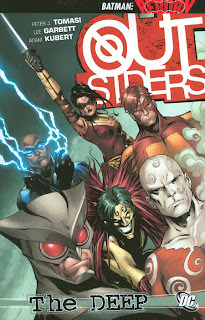 Outsiders: The Deep rests on both Final Crisis: Revelations, and DC Universe: Last Will and Testament, and Tomasi effectively weaves this story. Geo-Force's rivalry with Deathstroke the Terminator burns palpable in their scenes together on the page, and Tomasi also writes the first meeting, in recent memory, between Ra's al Ghul and Vandal Savage, noting recent changes to both characters. If you were a fan of either of the previous stories, this is your next stopping point, though the tertiary nature of those tales can make The Deep also feel like an afterthought. Indeed, my difficulty with The Deep is that nothing much comes of the book's sound and fury. Amidst numerous cut-scenes of the Insiders worrying about their immortality, the Outsiders run around a bit, fight a robot, run around some more, fight Deathstroke, and then defeat the Insiders largely through a deus ex machina shuttle crash; Ra's al Ghul and Vandal Savage barely have anything to do with the plot at all. The Outsiders are right, the Insiders are wrong, and the story's resolved neatly in the end. Tomasi makes no egregious mistakes and treats the characters with care, but the story offers no larger payoff for the reader, and as such I'm not left with much impetus to come back again. Of course, it's perhaps because of this very thing that, after the next volume, Outsiders: The Hunting, this title gets a new writer (Dan DiDio himself) ... and begins to tie to Superman: New Krypton. That's something of a dilemma for me, because on one hand, I'm none too impressed with the current Outsiders tenuous ties to Batman RIP, and I don't expect the ties to Superman to be any more solid; on the other hand, the completist in me wants everything related to New Krypton even if it's just the barest mention in an issue. And if I'm already going to buy the next Outsiders trade after The Hunting, it stands to reason I might as well just buy Hunting as well. And while I recognize I'm in a quandry of my own making here (and "I could stop any time," so to speak), this is where a comics fan begins to get a little frustrated. Despite that reading this Outsiders makes me miss my much-favored team from a few years past, Peter Tomasi treats some old heroes with respect in this volume, and I appreciate it even if The Deep wasn't quite a hit for me. I thought you'd be wondering about Thunder's comatose state, since DC never collected Frank Tieri's fill-in run, and she was still conscious and active in Final Crisis: Submit. I hope the tie's to "Last Will and Testament" aren't too clear in this volume, because that story's pretty much been kicked out of continuity very, very recently. Which is alright with me. The changes Brad Meltzer tried to make to the classic Terra story were, frankly, stupid. I'm left wondering where this series is going to end up either way though. I'm hoping Dan DiDio can make something out of the title. I've wanted to give it a shot, but it seems to change direction every three minutes without one ever really sticking. My interest has waxed and waned chiefly because of this. I was interested when it involved Batman, but when he left the overall title so early through RIP, I lost interest. Then came Peter Tomasi; interest comes back. He does little and leaves after two (three if you count the Blackest Night tie-in) arcs; interest drops. Say what you will about Judd Winick, but at least he stuck with the book and gave it a clear direction. The title has seemed to go right off the rails as soon as he left it. Which is odd when I think about it, considering he's the one who helped basically derail the Titans book concept. I was wondering about Thunder, but I read the Outsiders Wikipedia entry and that told me all I needed to know. This story relied heavily on both DC Last Will and Testament and also the Deathstroke Faces of Evil special, and I wish DC had included both inside. I do begin to think of the Winick Outsiders/Johns Teen Titans as the golden age for these two titles. I've considered dropping each of these titles now, when once they were some of my first-reads. Without spoilers, does Last Will and Testament go out of continuity in Blackest Night, or earlier? In Blackest Night. Blackest Night: Titans did a lot of damage to the Terra plot point of Last Will. But it's the Outsiders tie-in issues where the "Terra was just drugged and made psychotic" issue was put to bed once and for all. Right where it belongs, actually, since the development meant more to Geo-Force than anyone else, so it's fitting it happened there. To be clear, I don't think "Last Will and Testament" has been taken out of continuity completely. Just the Terra business. I'd wager the events still happened in continuity. It can just be assumed now that Deathstroke was lying to rile up Geo-Force. The Terra changes in DC Last Will and Testament seemed to me like so much wishful thinking on Brad Meltzer's part -- let her be a villain, for gosh's sake! Thanks for the info. Brad Meltzer has outright admitted he was attached to Terra - despite the clear indications from the start that she was no good - and was crushed when she really did betray the Titans to the end. Last Will seemed a very poor fanficish attempt to make things the way he wished they had been, not as they were. Why it was allowed, I'm not really sure. Either way, it was summarily rejected by pretty much anyone who was ever a Titans fan, so thankfully DC took the hint and dropped it like a rotten potato. Either way, you're welcome. I suspect the Blackest Night tie-in will be in the next volume of Outsiders.